At a media lunch ahead of Sunday’s GoPro Grand Prix, Montoya and Hinchliffe reflected on what drivers like about the 12-turn, 2.38 mile course situated in Northern California’s wine country. For Montoya, who has previously raced the circuit in stock cars, the change to an open-wheeler was eye opening. 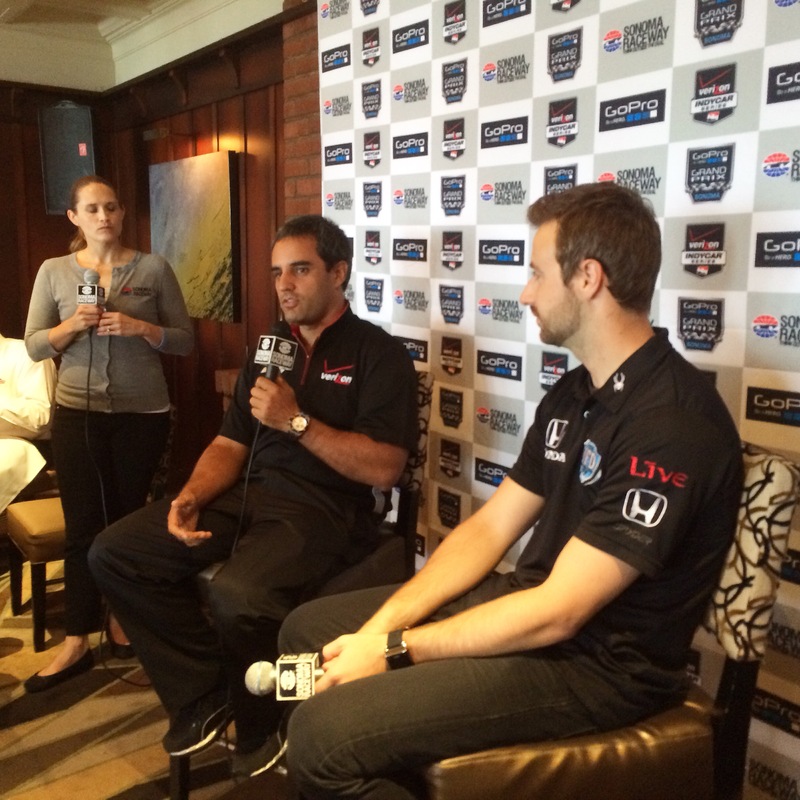 “It’s fun to be on the gas,” Montoya said. “It’s incredible how slow (the Cup) cars used to go here. It takes half a straight to get wide open (in a stock car)”. Hinchliffe conceded that Andretti Autosport has not experienced much success at Sonoma, although Ryan Hunter-Reay has tested here, and the team hopes to change its fortunes. “If we have a bad weekend, I’m blaming Ryan”, Hinchliffe joked. Hinchliffe was kidding, but he was visibly disappointed by the lack of testing compared with Montoya and Team Penske, who have visited the circuit several times this season. 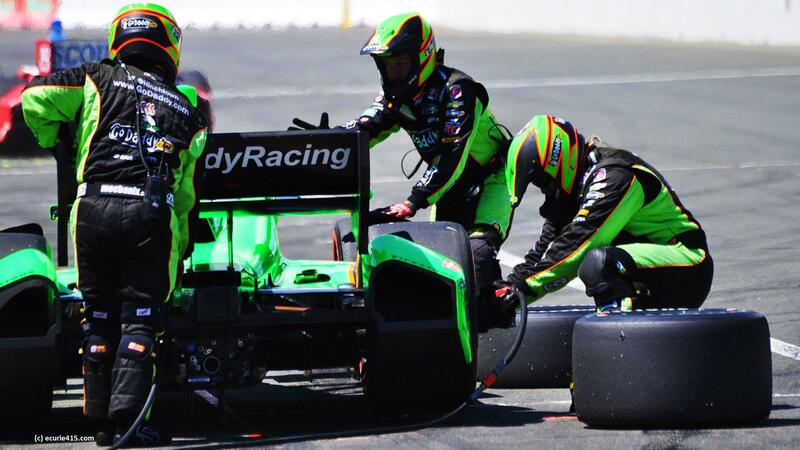 It’s especially difficult because there is no Friday practice for the IndyCar Series this week. It’s the unpredictable nature of the circuit that both drivers agreed makes it a challenge. Hinchliffe said that some drivers would prefer to skip the morning practice because the data, taken in the early morning cold, does not correlate to conditions at race time. Sonoma experiences wild swings from cool, gray mornings to blazing hot afternoons, followed by stiff sea breezes in the afternoon. Qualifying this year will take place in late afternoon. Hinchcliffe even cautioned against gleaning much from the data, lest the team change an otherwise optimal setup based on the wrong weather conditions. Inevitably, both drivers’ thoughts turned to the championship leader, Montoya’s Penske teammate, Will Power. “We’re all chasing Will”, Montoya said. The Australian has a comfortable lead as the series heads into the next-to-last round, and Power already has three wins and a second place at Sonoma. Getting Power out of his groove won’t be easy, although Montoya is never short of confidence. In most years, winning at Sonoma requires equal parts aggression and tire management, knowing when to push and when to let the race come your way. Cautions are a fact of life, ruining strategies and mixing up the field. Hinchliffe expects a few of the mid-grid qualifiers to start on Firestone’s black tires, trying to make something happen at a circuit where it’s difficult to find passing room. And that’s part of what makes road racing at Sonoma special. When Montoya described some of the more challenging turns, he had a big grin on his face. Like he was having fun…the way it should be. **Qualifying for the GoPro Grand Prix is live on NBC Sports Network and @LiveExtra at 7:30 pm et on Saturday. This entry was tagged GoPro Grand Prix, IndyCar, James Hinchliffe, Juan Montoya, Sonoma. Bookmark the permalink.